Why CATterrain? Our blocking terrain is 100% usable as abrupt elevated terrain. Each of these two-tone pieces have a small flocked area (tricolor blended turf & some lifelike grass) that represents clear terrain. The building area is coated with a textured, concrete gray fleck-stone effect. Resulting in a strong urban look that corresponds to W5 & W6 Watercourse and W3 & W7 Canal. 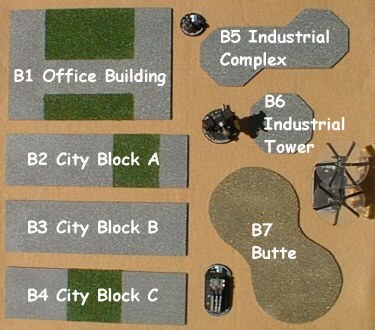 All of these pieces represent solid buildings that are completely covered with a textured, concrete gray fleck-stone effect. Easy to use as is, or as a sturdy base for something of your own custom design. Again, the uniform urban color scheme ties these pieces into the 21-piece system. This terrain piece is completely flocked with an earth-tone mix of brown railroad modeling sand and small gravel to represent a dirt hill. The gravel flocking effect matches the borders on W1 Lagoon, W2 Pool and W4 Tarn.